In Sydney’s landmark World Tower on floors 61 and above, these luxurious apartments feature a spa bathtub and floor-to-ceiling windows with panoramic city views. Guests have access to an indoor pool, a hot tub, a fitness center and a sauna. Meriton Serviced Apartments - World Tower is in the heart of Sydney’s city center, less than a 10 minute walk from Hyde Park, Chinatown, and the Queen Victoria Building. The World Square Monorail Station in the building provides easy access to Darling Harbour and Star City Casino. The air-conditioned apartments include laundry facilities and a gourmet kitchen with European appliances. Each apartment also has a flat-screen TV with cable channels and a DVD player. You can enjoy amazing views from the heated indoor swimming pool on level 61. The sauna and hot tub are the perfect place to relax at the end of a long day of sightseeing. 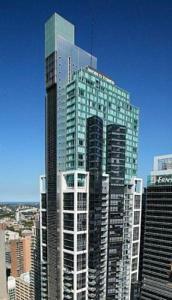 Meriton Serviced Apartments - World Tower is in Sydney’s tallest residential building. The complex features a large number of shops, supermarkets and restaurants. Rooms: Apartments: 115, Hotel Chain: Meriton Serviced Apartments. Public parking is possible on site (reservation is not possible) and costs AUD 45 per day.